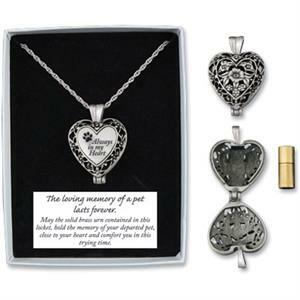 Keepsake jewelry is a nice way to feel comforted by having a part of our pet with us at all times. 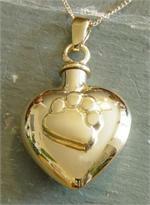 A very small portion of your pet's ashes are secured inside the pendant and makes for a wonderful tribute. 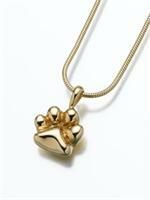 Over the years, pet cremation jewelry has grown in leaps and bounds. Once simple and plain, there is now a complete selection of pendants in a variety of sizes, styles and colors. 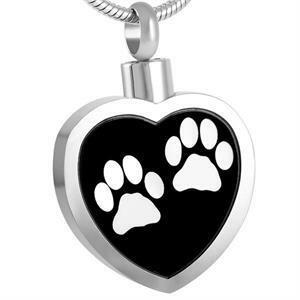 You can choose from dog bones, dog dish, and pawprints to ball of yarn and even your pet's photo engraved on the pendant. 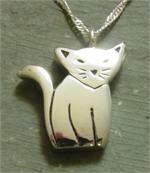 Some pendants come with their own chain or you can supply your own. Engraving is offered on many pendants but due to their small size, the characters can be limited to shorter names or initials. Rainbow Bridge Urns has a nice selection of pendants in 14K Gold, Sterling Silver and also those made from more economical base metals such as nickel or sterling silver. 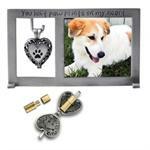 Click on your chosen metal below to see our assortment.